Posted on June 20th, 2016 by Cindy. For such a small country, Iceland bursts with adventures. Known as the Land of Fire and Ice, Iceland is full of just that — from volcanoes to glaciers, hot springs to snowy waterfalls, it’s a land of extremes. Visit during the summer and experience 24 hours of daylight. Or walk along Latrabjarg Cliffs and feel like you’re at the edge of the earth. There are few other places where you can relax in 100 °F hot springs while reaching out to grab a handful of snow. Last month, my friend Tim spent a few weeks exploring Iceland’s extremes. He rented a car and drove the entire Ring Road — the highway that winds along the perimeter of the island nation. He was completely blown away. 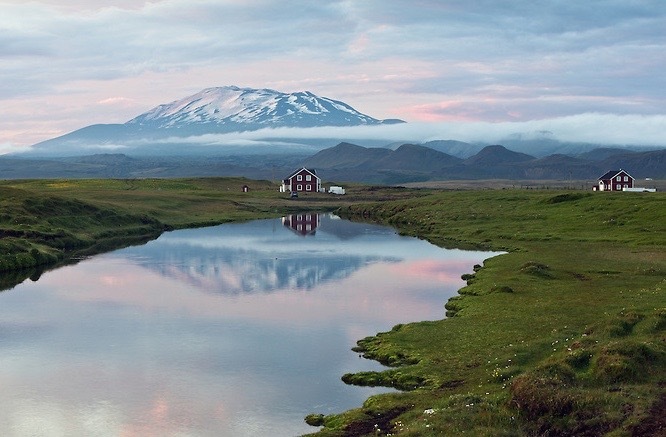 Not only is Iceland filled with stunning landscapes and once-in-a-lifetime adventures, but it is also one of the most sustainable countries on the planet. Geothermal energy provides 25% of the nation’s electricity, and utilizing renewable sources meets over 85% of Iceland’s overall energy needs. Yale University named Iceland the country with the cleanest energy in the world, and they are also the world leader in pollution control. Their use of natural resources itself has even become a tourist attraction: Perlan is one of Reykjavik’s hot water storage tank systems, and it’s also a popular destination on the tourist circuit. Perlan’s popularity demonstrates the unique combination of environmentalism and tourism that Icelanders takes pride in. I sat down with my friend Tim to pick his brain and hear all about his trip — it didn’t take long for me to start Googling flight prices and figuring out when I could go and experience Iceland for myself. In fact, I’ve become a little obsessed with Iceland and I find myself planning a trip for next summer. Here are five reasons why Iceland’s mix of sustainability and splendor should make it both your (and my) next trip! Currently ranked #3 on the listing of the 2016 World’s Happiest Countries, Iceland’s hospitality is as warm as its hot springs. 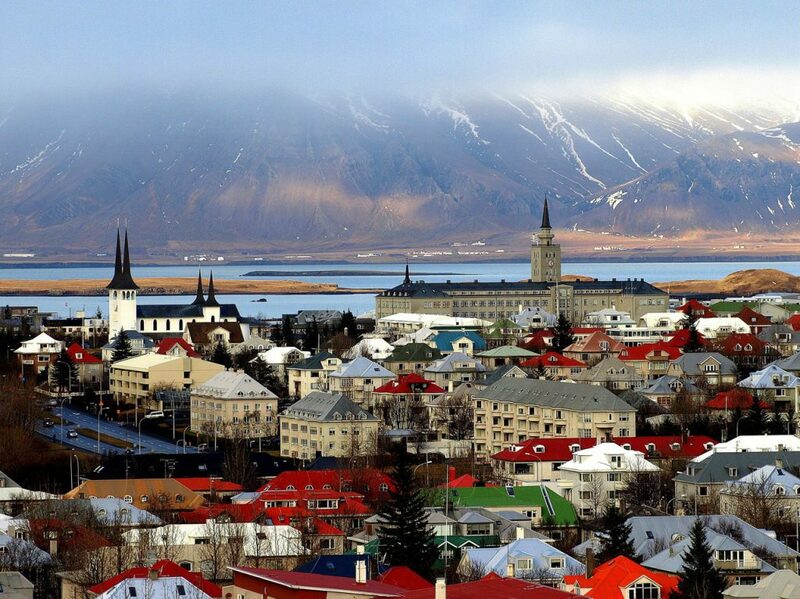 Whether you choose to stay in Reykjavik or venture into the picturesque villages scattered throughout the country, prepare to be surrounded by quaint architecture, fireplaces, and lots of sheep. Icelanders are proud of their language and their Nordic culture. They also love literature; there are more writers in Iceland per capita than any other nation in the world. In fact, one out of every ten Icelanders has published a book. They also have a fierce history of storytelling. Elves, trolls, and ghosts fill Iceland’s traditional mythical folk tales, which take inspiration from their extreme surroundings. The Land of Fire and Ice is home to 130 volcanoes, including Helka, one of the most active volcanoes on earth. Popular for a different reason, Thrihnukagigur Volcano has been dormant for over 4,000 years. This unique volcano allows visitors to view its prehistoric formations from a different perspective: inside the volcano. Put on a helmet, strap into an open elevator, and descend 120 meters to explore the phenomenal rock formations inside. Inside the Volcano offers sustainable treks, and they also fund research projects. These projects explore the magma chamber and the inner workings of Thrihnukagigur, allowing scientists a unique opportunity. Located only 25 minutes outside of Reykjavík, it’s definitely a must-see on any trip. If you’re looking for something a little more relaxing, check out the Blue Lagoon. This man-made, geothermal spa uses naturally occurring seawater. Even better, it’s one of the few places in the world where you can relax in 40°C water and view the snowy landscape an arm’s-reach away. The Blue Lagoon isn’t the only famous hot spring in Iceland, you can try a few of them to find your personal favorite. The adventures don’t stop at volcanoes and hot springs — you’ll need to visit some geysers as well. 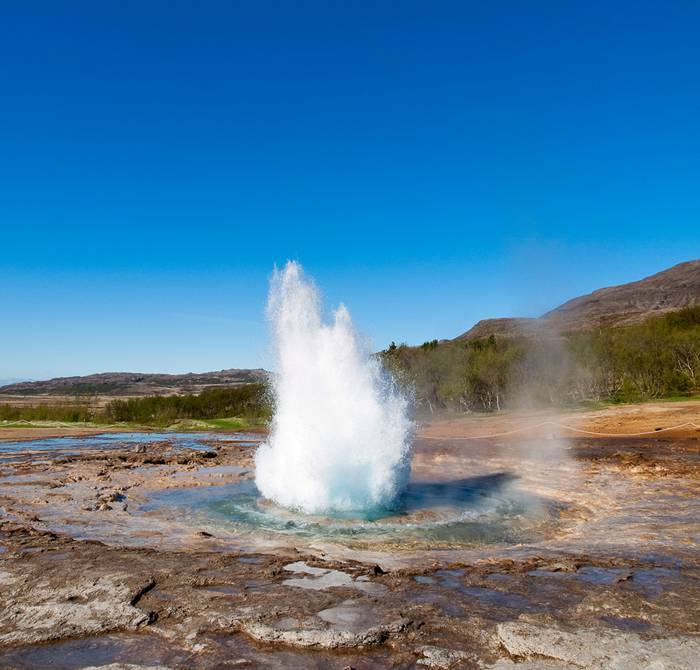 The word ‘geyser’ comes from a specific geyser in Iceland named ‘Geysir,’ deriving from the Icelandic ‘geysa’ which means ‘to gush.’ Geysir is located about an hour from Reykjavík. Right beside it is another geyser, Strokkur, which erupts every few minutes. Pay close attention right before it explodes, a light blue bubble emerges from the pool. Strokkur (Icelandic for “churn”) is among Iceland’s most famous geyser, it erupts regularly every 4-8 minutes. Strokkur has a long history of activity beginning in 1789, after an earthquake unblocked the geyser’s plumbing system. It continued to erupt until 1896, when another earthquake blocked the conduit of the geyser. Then in 1963, locals cleaned out the blocked conduit and the geyser has been regularly erupting ever since. 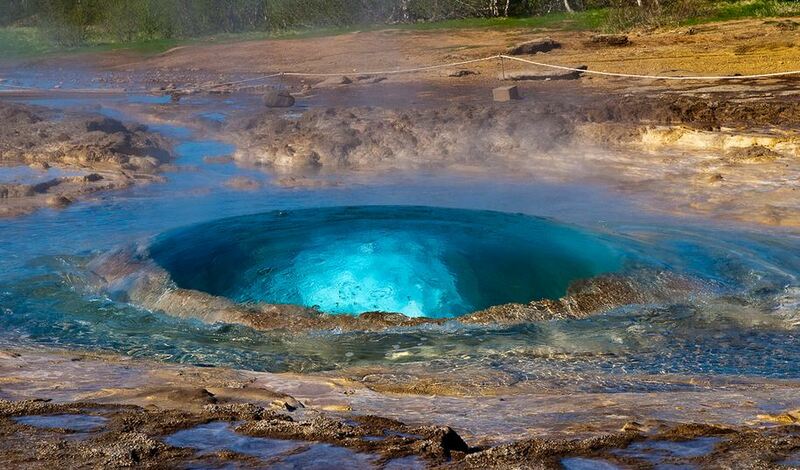 Blue bubbles simmer at the surface of Strokkur right before it explodes. 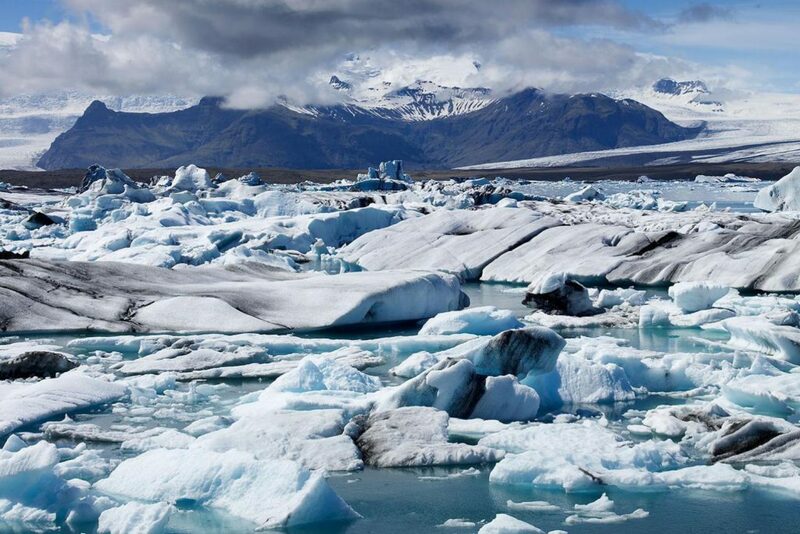 Ten percent of Iceland is made up of over 300 glaciers, including Virkisjökull Glacier — the largest in Europe. Walking onto a glacier and being immersed in ice mountains and teal water pools is nothing short of surreal. The cracking and crunching with every step reminds you of the impermanence of your surroundings. Along with a precarious feeling accompanying the extra-crackly steps, you’ll also gain whole new awareness of your environs. One of the easiest glaciers to explore is Sólheimajökull Glacier on the south coast. Several companies in Reykjavík organize day trips from the city. 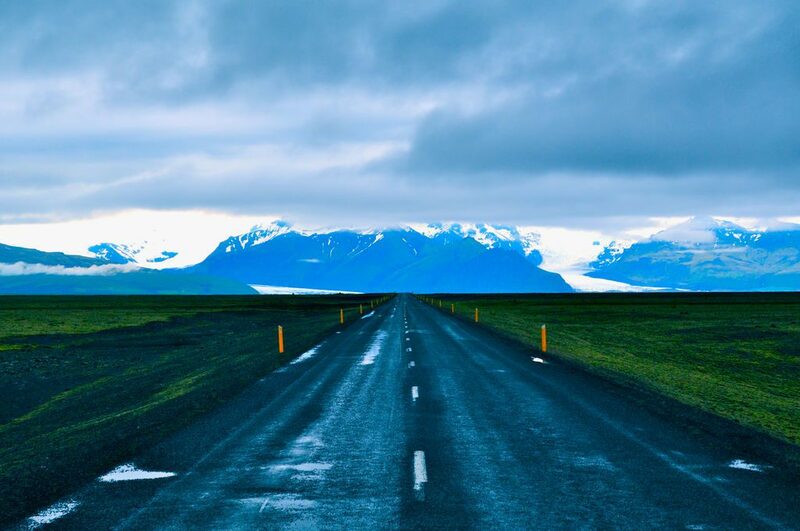 Iceland Tours is our recommendation, it does an excellent job of practicing sustainability by minimizing the impact of the tour on the environment — and they have lots of other tours in addition to Sólheimajökull Glacier if you have the time! Looking for an extra thrill? 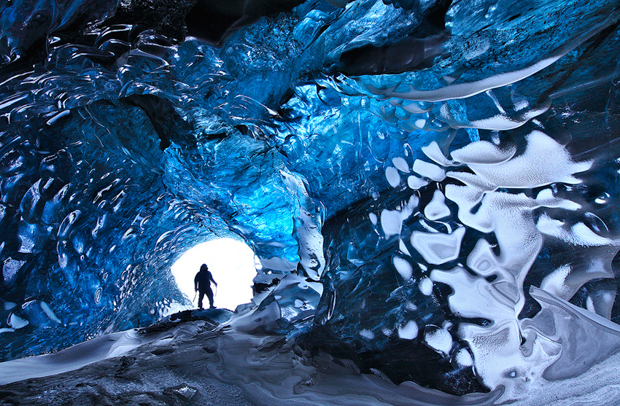 Explore Iceland’s stunning ice caves, sometimes called crystal caves. You’ll get a whole different angle on these monster glaciers. Vatnajokull Glacier in the southeast and Langjokull Glacier in the southwest are the most popular and safest caving destinations. There are few places like Iceland, where you can find such beauty in the harsh extremes. If you visit in the winter, September through April, you’re likely to witness the northern lights pulsing through the night sky. Enjoy nature’s fireworks while the colors dance between the stars. Clear, cold nights are best. Unfortunately it never really gets dark enough in the summer months to see them. Iceland is a treat for all photographers of all levels. There’s Asbyrgi Canyon, with its legends about hidden people inside. And Skaftafell Park, which offers the best landscapes on Earth. Be sure to do some late-night exploring; hiking in the midnight sun offers stunning lighting, giving a whole different look to your shots. 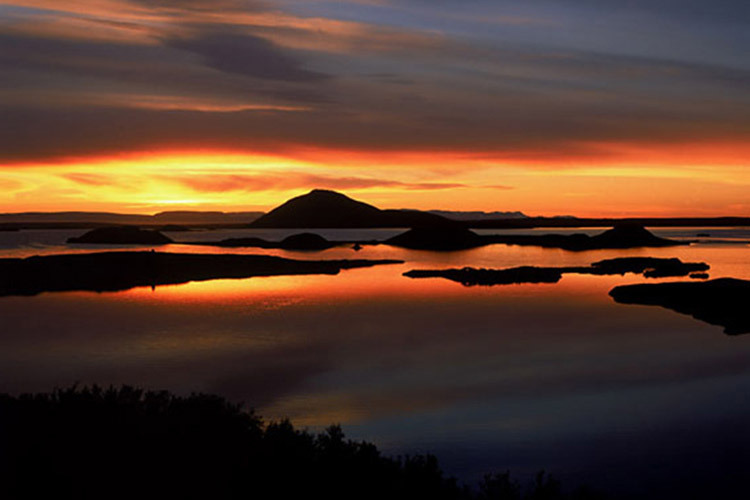 One area which you definitely shouldn’t miss is Lake Mývatn. In addition to stunning landforms, the area is also home to many ecofarms, which are chock full of fascinating Icelandic traditions. 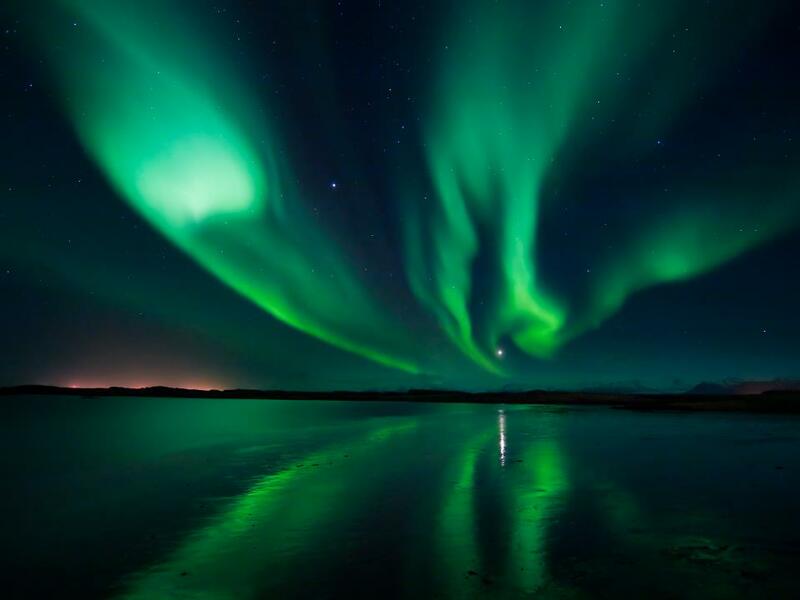 The northern lights pulsing through the night sky on a clear, cold winter night in Iceland. The landscapes aren’t the only thing to photograph in Iceland; the country also has phenomenal birding. Hornstrandir Nature Reserve is the best place to check out native species. 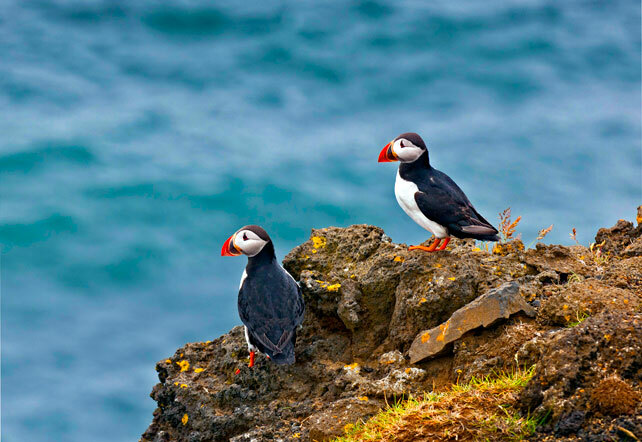 Latrabjarg Cliffs are home to thousands of puffins, among other birds. Standing on the edge of the cliff literally feels like you’re standing at the end of the earth. Plus, viewing these awesome creatures in their natural habitat is pretty amazing. There’s more than birds too! Iceland is a whale watcher’s paradise. 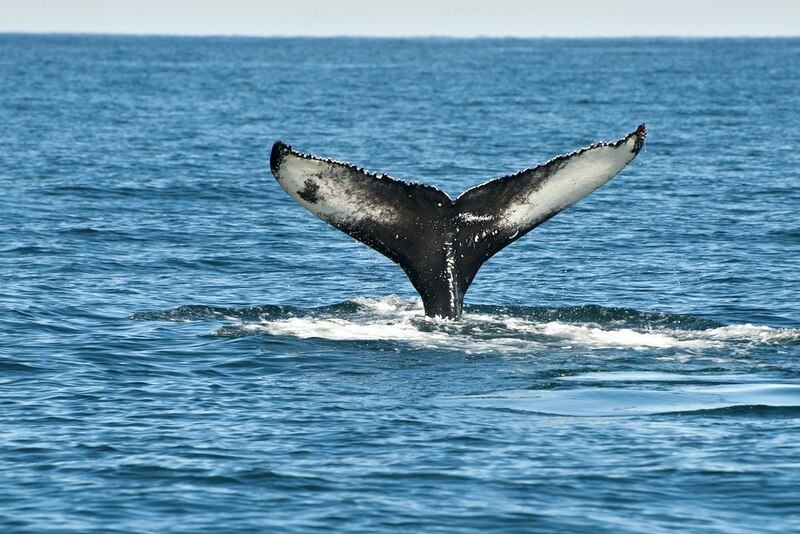 In northern Iceland, check out North Sailing, they offer sustainable, carbon-free whale watching trips that won’t break the bank. In Reykjavík, Elding comes highly recommended for responsible travelers. They run low-impact tours and have options at every price-point. Enjoying time outdoors and supporting businesses working to preserve the naturaleza is a great way to add sustainability to your trip. You can do anything from riding Icelandic horses to walking behind waterfalls. And don’t forget to check out Silfra, an beautiful diving/snorkeling spot directly on top of the cleft separating the Americas from Europe. The water is stunningly clear, and on a good day visibility is up to 100 meters. Unfortunately, global warming and Iceland don’t mix. The ice is melting fast, and some estimates have the country glacier-free by the end of the century. Some find it poetically beautiful to watch parts of a glacier drift off to sea against the black sand at Jokulsarlon Lagoon, or to romanticize the idea of polar bears floating over on icebergs from Greenland (this really happens!). But the truth is, Iceland won’t be the same for much longer. To adapt to the changing environment, many tour companies now offer kayaking tours to explore glaciers versus the trekking options which were previously available. 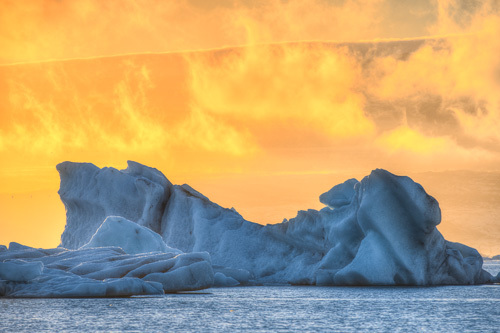 Climate change is strongly affecting Iceland. Now’s the time to go. And it’s pretty easy to get there, too. Icelandair offers passengers with a layover in Reykjavík the opportunity to extend your layover for up to a week — giving you a chance to explore the country. And last year, a new airline, called WOW, started offering $100 one-way flights from the USA to Iceland. As Iceland attempts to boost tourism, travelers can take advantage of Iceland as a budget-friendly destination and can travel there with ease. After talking with Tim, I can’t wait to plan my Iceland adventure. Have you been to Iceland? Let us know what other spots are worth checking out! Cindy is a traveler with an insatiable urge to immerse herself in other cultures. She has been traveling around the world for the past six years, and is currently living in Cordova, Alaska for the summer. Follow her adventures at Casilocal. 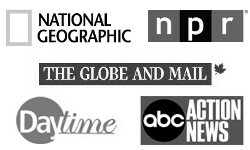 She is also a GV Ambassador helping map the world of social enterprises and sustainable volunteer opportunities.